Your flight leaves San Pedro at 7:45AM for Belmopan. Upon arrival you will be met byu your horses and guides from Banana Bank Ranch for a ride through the smallest capital city in the world. Stop by the local markets to sample fresh produce then continue on into the rainforest where you will experience the flora and fauna of Belize. 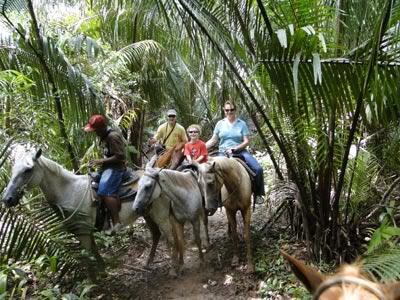 Your guide will also point out traditional medicine plants and other curiosities of the jungle. You will have lunch on the riverbank where you can take a swim to cool off before your return ride to the airstrip and flight home. What to bring: Comfortable clothing (long pants suggested), swim wear, hat, sunscreen, sandals, repellent, and camera.